Baby, it's cold outside. But when you throw on some snowpants (parents included) and get out there and revel, it can be a winter wonderland. And there are some nifty places to do it. Bear Mountain State Park doesn’t just have amazing hiking trails, scenic views and Octoberfest. There’s also a picturesque outdoor ice skating rink with public skate times. Morning sessions on Mondays and Tuesdays are great for homeschoolers and preschoolers, and the Friday night session is popular with middle schoolers and teens. You can even sharpen your skates for just $5. For double the fun, go on the weekend when the nearby carousel is open. Call the rink before you go (it’s weather-permitting), and check the website for pricing and additional holiday times. Weekend parking is $8, or free with the Empire Pass. Lockers and vending machines are available at the rink and there’s a snack bar at the carousel. Carousel is open weekends and some holidays; $1 per person. 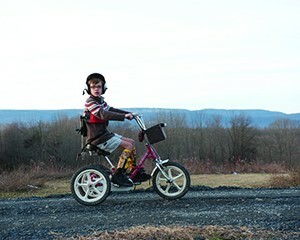 Hunter Mountain has lots of ways to introduce the kids to skiing. There’s an all-day or half-day PlayCare option where kids ages 2-6 can play games, hear stories and do crafts in a caring environment while the more experienced skiiers in the family hit the slopes. Registered three-year-olds can opt for a private ski lesson while at PlayCare for an additional $40. There’s also beginning ski instruction at the All Day Ski and Play Program, where 4-6 year-olds, who aren’t ready for all-day lessons, can alternate between group instruction and free play in the PlayCare. It’s $130 and includes equipment rental, a lift ticket, and up to 9 hours of childcare. Pre-registration is required. Families with kids who have physical and developmental impairments can go skiing, too. Two mountains offer adaptive ski programs where children (and adults) with disabilities have different options for private lessons with various adaptations for physical impairments (including sight) and developmental disabilities. It’s for all levels of ski experience. Bellayre Mountain’s Adaptive Snowsports Program runs seven days a week during the season. Windham Mountain’s Adaptive Sports Foundation is the largest of its kind on the East Coast and offers half- and full-day options. (Keep the latter in mind for summer sports, too.) Using the adaptations and one-on-one guidance from caring instructors and volunteers, kids can learn to maneuver with the equipment to experience that mountain thrill. 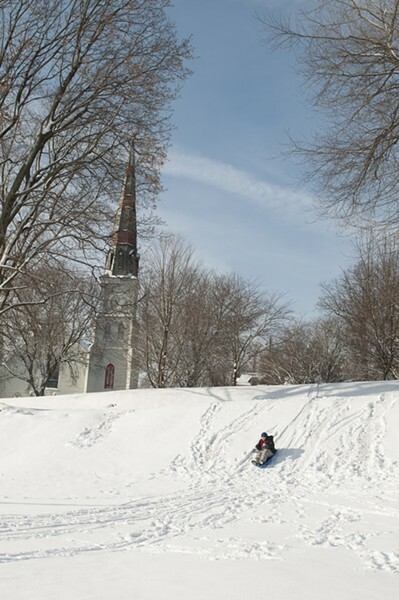 Of course, there's also always the ever-available, always-local and free outdoor adventure option: sledding! Let's start a sled hill resource list right here. My family loves Cornell Park in Kingston. The first of the double-dip hill is great for littles, and the bigger second dip is exciting for older kids. Where do you go sledding?